The evil Fox news made her do it. 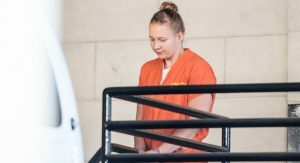 A National Security Agency contractor accused of leaking a classified report on Russian hacking aimed at the 2016 election told FBI agents she smuggled the document out of a high-security intelligence facility in her pantyhose. That and other details appear in a transcript federal prosecutors filed in court Wednesday detailing the interrogation of 25-year-old linguist Reality Winner by the FBI as they carried out a search warrant at her home in June. After insisting for some time that she printed out the report and kept it on her desk for a few days before disposing of it in a burn bag, Winner caved and acknowledged she hid the document before sending it off to a news outlet, now known to be the Intercept. The transcript hints at possible political motivations for the leak. Winner says she objected to her workplace tuning the TV to Fox News. She also had a signed photo of CNN Anchor Anderson Cooper, although she said the signature was fake.